Olentangy’s Luke Riedel (5) drives to the hoop during the first half of Thursday’s season opener against visiting Marion Harding. So much for early-season rust. 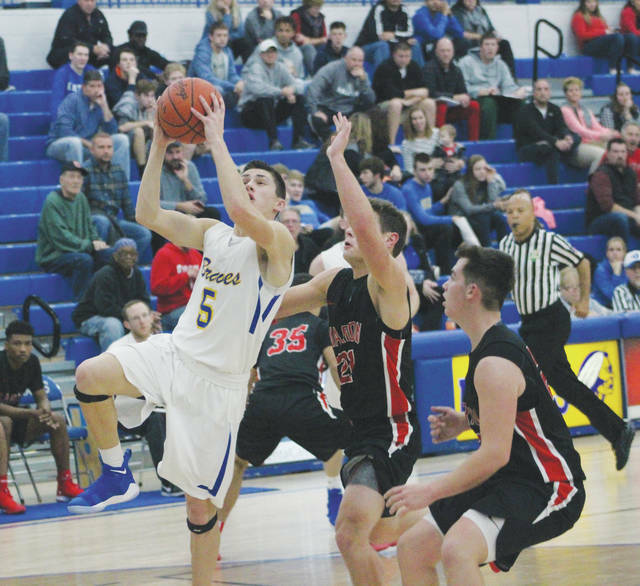 Just one game in and the Olentangy boys basketball team looks to be in midseason form on the offensive end. The Braves finished a perfect 17-for-17 from the free throw line, shot 52-percent from the field canned 41-percent of their threes en route to an 81-59 win over visiting Marion Harding in Thursday season opener. The Braves led 23-18 after the first quarter and, thanks to a 17-13 second, found themselves up 40-31 at halftime. They outscored the Presidents 41-28 in the second half to smooth out the scoring summary. Marks was limited in the third, that’s true, but he pretty much scored at will in the other three quarters. The junior finished with a game-best 31 points, including 11 in the fourth. Jerred Kinnaird was also solid, finishing with 15 points thanks in part to a pair of three-pointers and a perfect 3-for-3 effort at the charity stripe, while Alex Sieve poured in 10 points and Luke Riedel had eight. DeJaun Smith led the Presidents with 14 points while Layne Stephens finished with 11 in the setback. The Golden Eagles played from behind most of the first half and managed just four points in third quarter as the visiting Warriors handed them a season-opening loss Thursday in Sunbury. Watkins Memorial jumped out to a 17-11 lead after the first quarter and, thanks to a 14-13 second, led 31-24 at the break. Big Walnut was still in striking distance, but the four-point third hurt. The Warriors ballooned their lead to 14, 42-28, after three and the Eagles couldn’t claw back. They scored 20 in the fourth, but it wasn’t enough. Sam Elliott led BW with 14 points while Jordan Koebel and Carson Becker had 10 apiece. Kegan Hienton was also steady, finishing with nine points in the setback. Watkins’ DJ Ortiz led all scorers with 18 points.